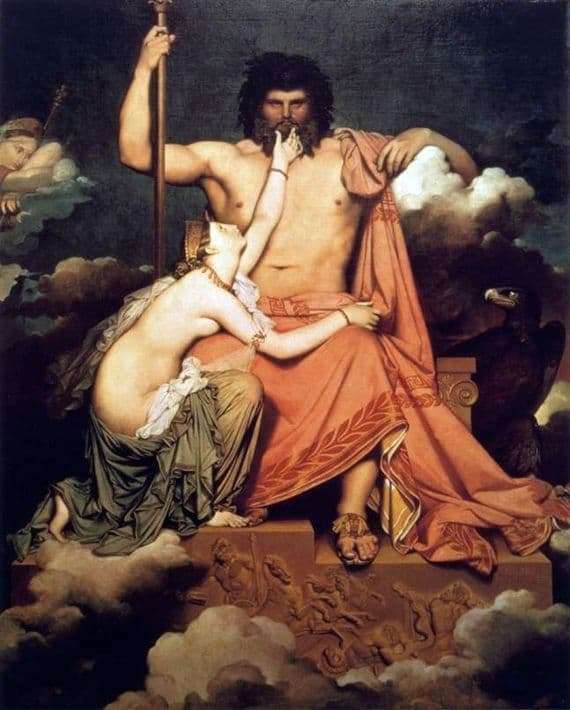 The famous canvas “Zeus and Thetis” by J.-O. D. Ingres was the last work written by the artist in his student years. The plot basis for the picture was the first song of the Homer Iliad. The artist is so imbued with this episode that he wanted to depict on the canvas the power of the main god on Olympus and the femininity of Achilles’ mother – the hero of the war with the Trojans – Thetis. In the famous painting, the painter depicted the main god of antiquity, Zeus (Jupiter), who solemnly sits on the heavenly throne. In the rule of law, he holds a symbol of power – the scepter, and with his left hand he leaned on a cloud in the sky. Near the throne sits an eagle, which personifies the power and height of flight. The bird focused its eyes on the supreme god. Before Zeus, Thetis bowed, the former lover. She gently touched the god’s beard with her right hand and hugged her knees with her left. The woman tearfully asks Zeus to protect Achilles, her son. Zeus does not react to the prayer of the most charming nymph of the sea Thetis, because the oracle predicted that their joint child would seize the father’s throne. To prevent this, Zeus ordered the Nereid to marry Peleus, an ordinary person. In the background on the left, Hera (Juno), the current jealous wife of Zeus, is watching the sneaking up. She understands that Thetis passionately implores Zeus using her feminine charms. However, the thunderer is not ready to change the will of the gods, he does not even look at the fact that this woman saved his throne from conspiratorial enemies. Turn the conversation with the gods into some kind of harem scene, keeping invisible distance between the characters.